What are the Hardest Positions to Fill in Northeast Ohio? A majority of Northeast Ohio organizations are planning to grow their businesses this year. Hiring projections from the 2015 ERC Hiring Trends & Practices Survey show that 84% of participating organizations have already hired one or more employees in 2015, and plan to make additional hires. Only 4% do not plan on hiring any employees this year. The 2015 ERC Hiring Trends and Practices Survey highlights hiring practices of 102 participating employers. Finding quality hires for highly-specialized positions is also proving difficult. These tough-to-fill positions include CNC Programmers, Metallurgists, Power Break Setup and Operators, Diesel Mechanics, and Implementation & Wellness Specialists. Hiring efforts require extensive company resources, which includes time. 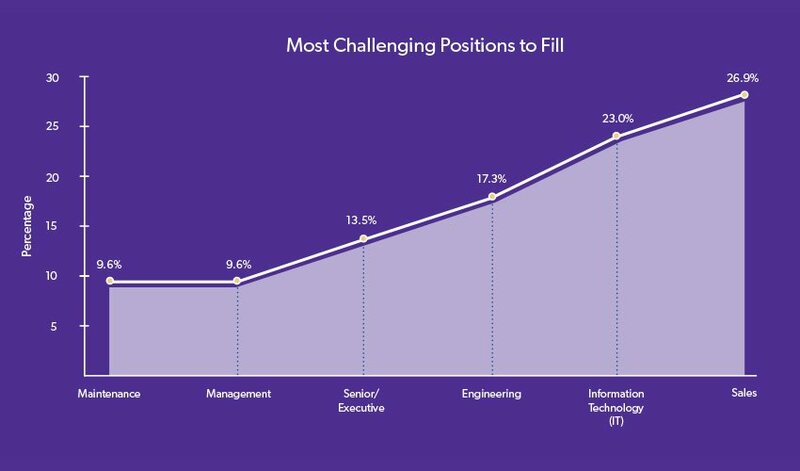 Positions with the longest average time to fill (in days) include Executives, Engineering, Management, Sales, and IT. Compared to ERC data from 2013, Northeast Ohio employers spent nearly one additional week trying to fill Executive positions this year, which take an average of 94 days. Organizations with 1-50 employees experience a longer vacancy period for Executive positions (144 days) than larger organizations. Additionally, Engineering positions take a significantly longer time to fill today (81 days) than they did two years ago (59 days). Overall, hiring costs have increased drastically since 2010. In 2010, local employers reported spending just over $1,000 as the cost per hire, as reported in the ERC Staffing Practices Survey. Five years later, organizations report spending an average of $5,433 on each new hire, and those with over 200 employees spend between $8,273 and $10,491. This trend is not unique to businesses in Northeast Ohio, as this is also the case for nationwide rising labor costs.